The beauty of being a website designer and a sailor, is that sometimes you get to create websites related to sailing. 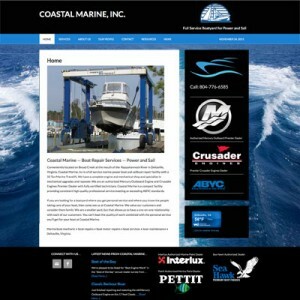 Two websites I have done recently are for Coastal Marine and Fishing Bay Marina, allowing me to combine my two passions. Coastal Marine is a small boatyard in Deltaville, Virginia on the Chesapeake Bay. 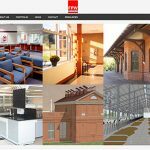 The owner, Reid Conley had not previously had a website, and I worked with him to create an online presence, including a Website and Facebook page. Coastal Marine is a small boatyard, but differentiates itself from other bigger competitors, by offering outstanding service and personal attention. Since most boat owners are really picky about who takes care of their boat, we tried to communicate the personal relationship and attention to detail that Reid gives his customers. I wrote the copy and even took photographs to help build this site. It incorporates a blog feature to allow Reid and his crew to post photos and stories about different boat repair and restoration projects they might be working on. 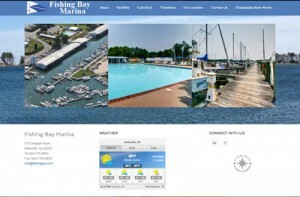 Fishing Bay Marina was under new ownership and the new owners approached EJ Communications to create a new web site. They wanted to position Fishing Bay Marina to be a Chesapeake Bay cruising boater’s destination of choice. Fishing Bay really caters to the transient boater, and so showing lots of photos of the nice amenities offered was important. One of the fun special features of this site is a map of the facilities with a magnifying glass to allow users to see all the details easily. Both sites are, of course, Mobile Responsive. 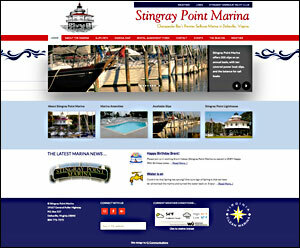 Stingray Point Marina is one of the “Best of the Bay” Marinas, it has many features and an active community of sailors. We wanted to show the beauty of the Marina as well as give a sense of the activity and vibrance.